Challah is an egg bread traditionally eaten on shabbat (the Jewish sabbath) that is similar in texture and taste to brioche, but is made without milk or butter. For shabbat, challah is usually braided using three or six strands, and on Rosh Hashana, it’s usually twisted in a circular shape (to symbolize the cycle of a year, as Rosh Hashana is the Jewish new year). And often times the bread is sprinkled with sesame or poppy seeds. As a kid, I ate my sandwiches on challah or challah rolls. And my mom always used it when she would make us french toast. Seriously, challah makes for the most incredible french toast! But the best way to eat a challah? The way my family does it now–rip into it and tear out the insides, leaving a shell of the crust. Mmm. This recipe, while time consuming, was pretty simple and oh so good! (In fact, I’m going to make a few loaves for Rosh Hashana later this month.) The bread is soft and chewy with a nice crust and the dough was easy to work with. There’s a lot of sitting and waiting, so it’s best to do it when you have stuff you can complete in spurts while waiting for the dough to rise. Finally, I halved the recipe (because I was trying out different recipes) but this is so good you should make the full recipe and freeze one loaf. (I tried this but got entirely too confused and just braided it with three strands, the same way you braid hair.) 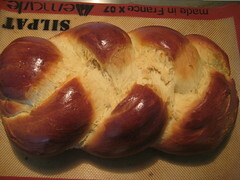 To make a 6-braid challah, either straight or circular, take half the dough and form it into 6 balls. With your hands, roll each ball into a strand about 12 inches long and 1 1/2 inches wide. Place the 6 in a row, parallel to one another. Pinch the tops of the strands together. Move the outside right strand over 2 strands. Then take the second strand from the left and move it to the far right. Take the outside left strand and move it over 2. Move second strand from the right over to the far left. Start over with the outside right strand. Continue this until all strands are braided. For a straight loaf, tuck ends underneath. For a circular loaf, twist into a circle, pinching ends together. Make a second loaf the same way. Place braided loaves on a greased cookie sheet with at least 2 inches in between. Joan Nathan recipe from The New York Times. I also use Joan Nathan’s recipe, but it is a slightly different one. 1 scant Tbsp yeast, 1/2-3/4 c. sugar and the rest is the same. She also bakes it 375F and then drops it to 350F and then lets the loaves sit in the oven to crisp up. I do 375F for 10 minutes, 350F for 20 minutes and then “off” for 10 minutes. Thats, of course, when I can sit home all day. Last Friday, I made three smaller loaves, put them in 375F for 20 minutes and then had to leave the house so I shut the oven off and they finished cooking for 40 more minutes. They came out pretty good 😉 I am going to try the freezing method…again. Havent had much luck, buth with Shabbat coming in so early soon, if I want challah, a girls gotta do what a girls gotta do. Try making apple stuffed challah for Rosh Hashanah 😉 Happy New Year! my cousin used to work at a bakery, and he brought us some of this kind of bread once. it was so delicious!! I cant wait to try to make it. This looks amazing and easy. I’ll have to try it. Thanks!